So when I saw someone on television make pizza using naan, a thin Indian flatbread, I thought it looked easy enough to give it a try myself. Where I live in the San Francisco Bay Area, you can find naan at most better supermarkets. It’s already baked and comes in a variety of sizes ranging from bite-size (think frozen Bagel Bites pizza snacks), to individual size (shown here) to large size (think medium pizza). It’s usually on the fresh bread aisle, but I’ve also seen it in the frozen food section. The other day I was surprised to see it in a refrigerated case at Costco in San Jose. If you can’t find naan at your usual supermarket, try a grocery store with a good selection of international food items. 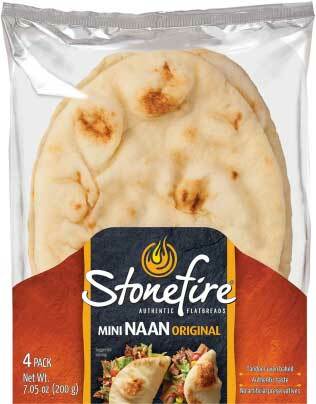 The brand I’m using here is Stonefire Authentic Flatbreads and the variety is Mini Naan Original. 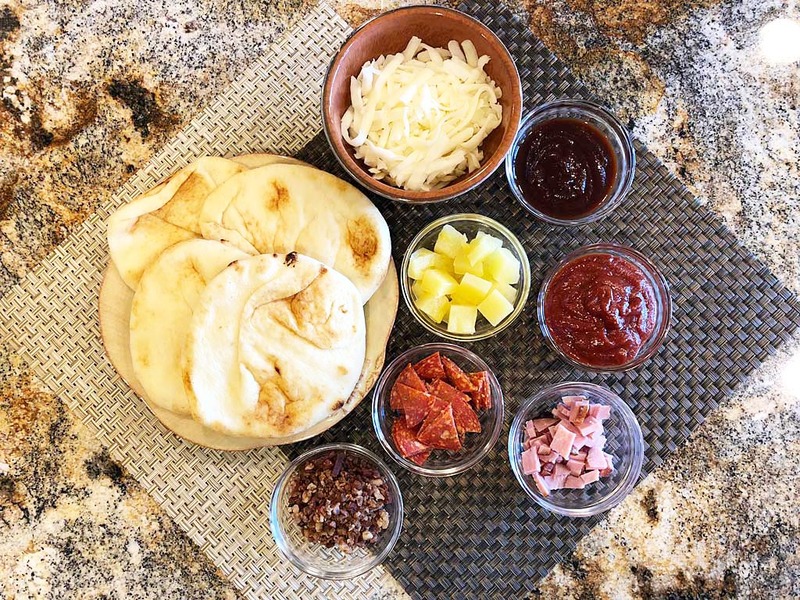 Stonefire makes naan in a variety of sizes and flavors, including whole grain, roasted garlic, and ancient grains. This variety is the perfect size for making individual pizzas. Making pizza is similar to making stir fry in that there’s a lot of prep up-front but then the cooking goes really fast! 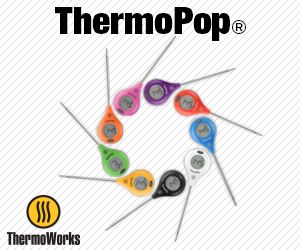 So gather together all your favorite ingredients in advance, have all your grilling tools ready, and preheat your Weber gas grill to MEDIUM and use a grill brush to clean the grates. As with any homemade pizza, you want to go light on the amount of sauce and toppings you put on these naan. Also, you should cut the ingredients down to size so they fit the small naan. 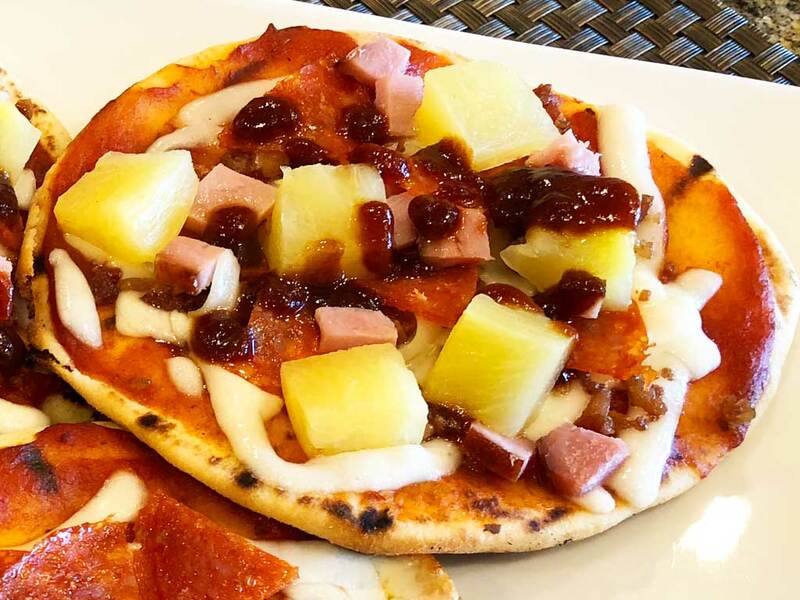 Here you can see that I’ve gathered an array of simple toppings, including pepperoni, ham, pineapple, bacon bits, mozzarella cheese, pizza sauce, and barbecue sauce. You can use anything you like. Arrange the naan on a rimmed baking sheet pan and lightly brush both sides with olive oil. Place the naan on the gas grill over MEDIUM heat. 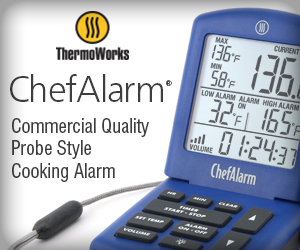 Watch carefully, they begin to get toasty in no time. Use a pair of tongs to lift the edge of the naan and check for toastiness. When the naan is warmed through and you’ve got nice grill marks on one side, remove them to a rimmed baking sheet pan. 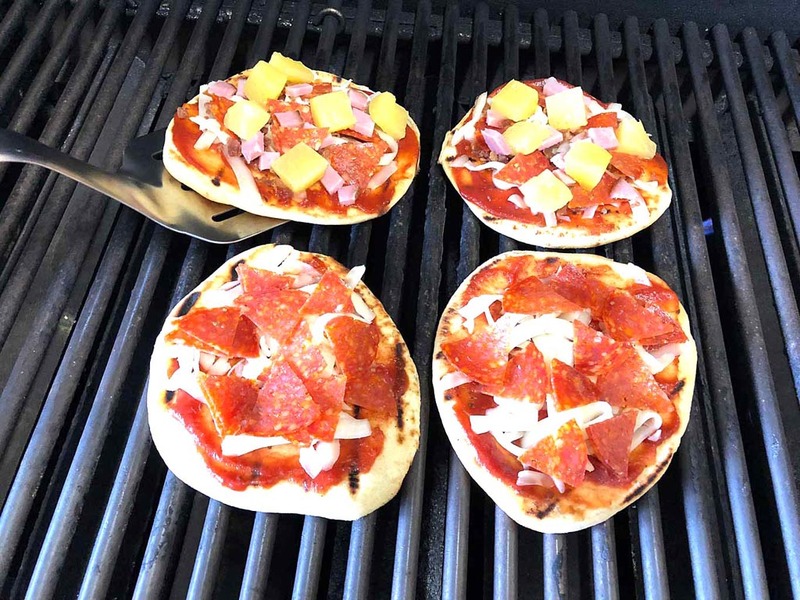 Turn the grill down to LOW and take the naan back in the house for toppings. With the toasted side facing up, apply a very thin layer of pizza sauce to each naan, then a small amount of mozzarella cheese followed by your favorite toppings. Again, less is more when it comes to these little guys…too much sauce and too many toppings and they don’t get warmed through before the naan burns. 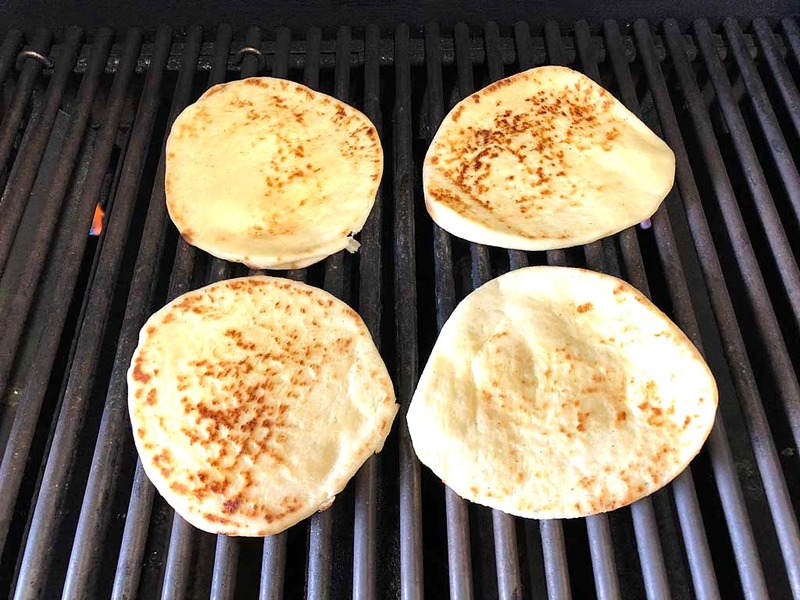 Use a spatula to place the naan back on the grill over LOW heat and close the lid. 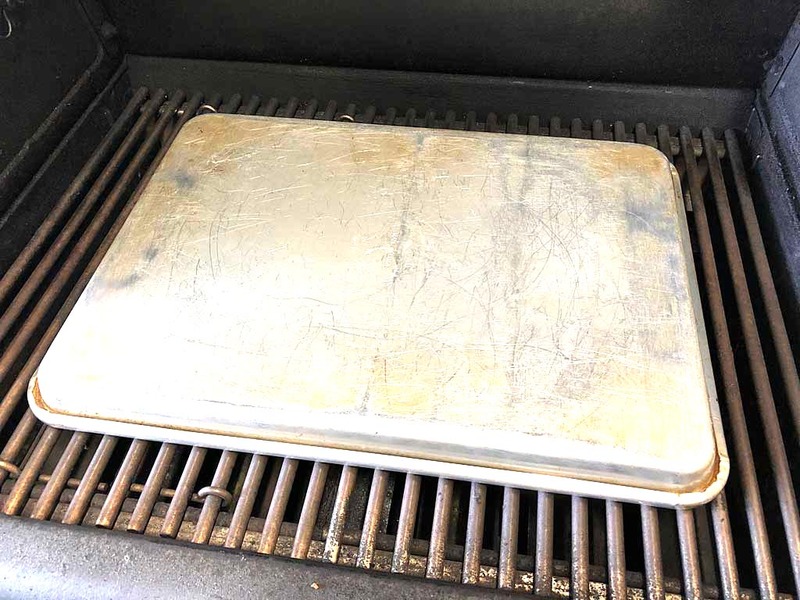 If your rimmed baking sheet pan is deep enough, you can place it over the naan to accelerate melting the cheese and warming the toppings. Melting the cheese and heating the toppings without burning the naan is the goal here, and it can be tricky. If all burners on LOW is starting to burn the naan before the toppings are heated through, try setting up the grill for indirect cooking with half the burners MEDIUM and half the burners OFF. 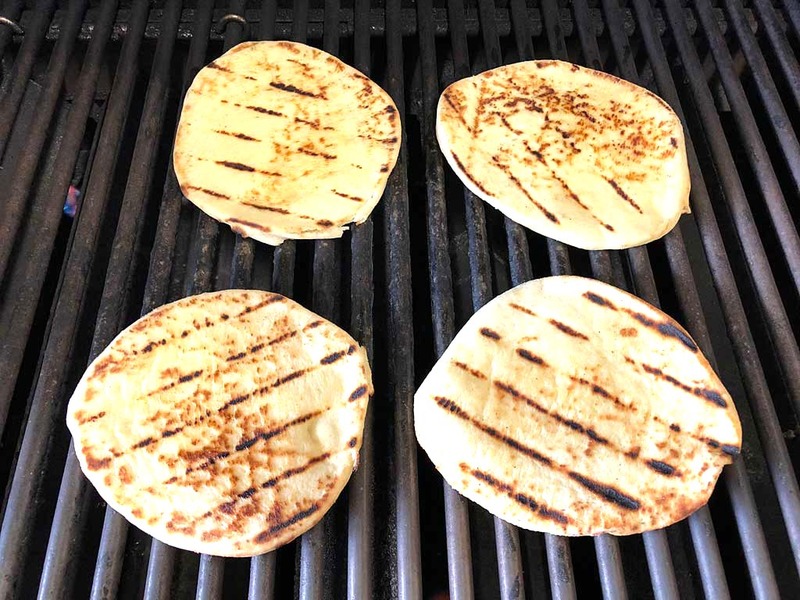 Start the topped naan on the cooler side of the grill until the toppings are heated through, then move quickly to the hot side for a toasty finish on the bottom of the naan. 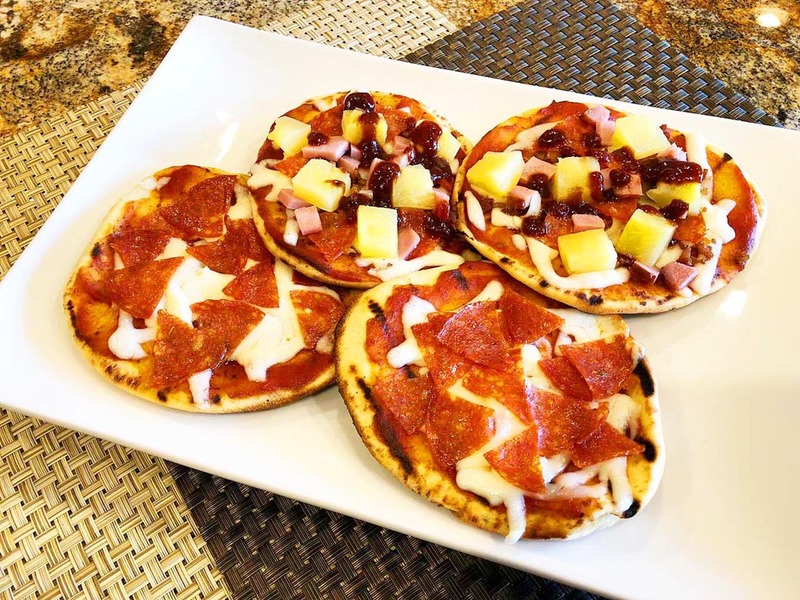 Plate up the finished naan pizzas and add any last minute toppings. The two naan pizzas shown at the top of this photo are “Tyler” pizzas made popular by the MOD Pizza artisanal pizza chain. 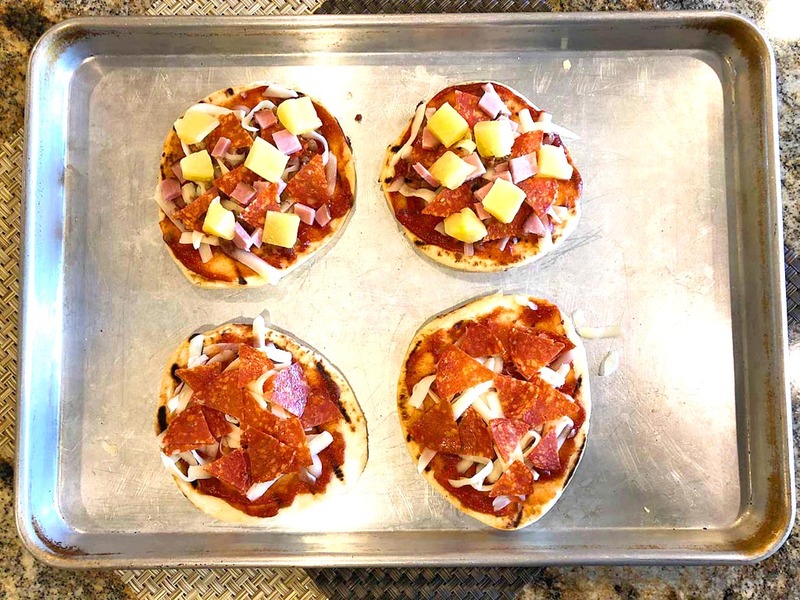 They consist of pizza sauce, mozzarella cheese, pepperoni, ham, bacon bits, and pineapple bits, then drizzled with barbecue sauce after baking. The two pizzas on the bottom are simple pepperoni pizzas. It turns out that naan pizzas are fun and easy to make, and pretty tasty, too. Give them a try sometime and I think you’ll be pleasantly surprised at how good naan pizza can be!